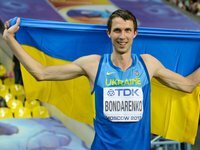 Ukrainian high jumper Bohdan Bondarenko has been named European Athlete of the Year. The European Athletics Association announced this at the award ceremony in Tallinn on Saturday, the press service of the Athletics Federation of Ukraine reported. This year, Bondarenko won at the 2013 IAAF World Championships and also the Diamond Race. The Ukrainian athlete's coach, his father Viktor Bondarenko received a trainer's award of the European Athletics Association.